A fun way to learn a famous Christmas Carol is to watch this 10-minute non-stop Jingle Bells and kids songs compilation video. 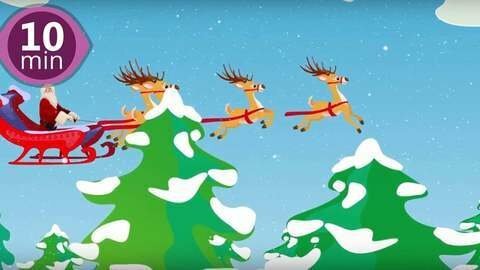 Sing to the upbeat carol while watching Santa ride the sleigh and dance with 2 reindeer, an angel and Mrs. Claus against the colorful cartoon background. Learn more songs while being entertained by going to SeeZisKids.